Buying a pool is much like the buying process of any large-ticket item. You don’t usually walk into a realtor’s office today and into your new home tomorrow. Similarly, if you do your due diligence in research and planning, it will take some time before you’re cannonballing into your new in-ground pool. Don’t worry, Aqua Pools is here every step of the way! Not to toot our own horn, but one of the primary advantages of partnering with Aqua Pools is that we won’t try to sell you on “our product”. We are professionals in fiberglass, vinyl, as well as gunite pools. So we aren’t trying to convince you that one or the other is the “best” option. We’ll work with you to figure out what the best option is FOR YOU. While every family who walks through our doors has a different story and different needs and different budget, we’ve outlined the typical pool buying process to help you map out your own pool buying journey. Get the family on board. We happen to think a pool is perfect for everybody! But we also realize that not everyone shares that view. We highly encourage you to get the whole family on board and excited about the pool. This prevents family riffs, like someone who resents getting a pool instead of going to Disneyland (trust us, it’s overrated) or a family member who doesn’t want to share responsibility for maintaining a pool. Buying a pool is like getting a dog — it’s best if everyone is supportive. Now that Mom, Pop, and the crew are thrilled that you’re getting a new pool, it’s time to have the “money talk”. Like buying a home or car, if the money doesn’t work, the rest doesn’t either. 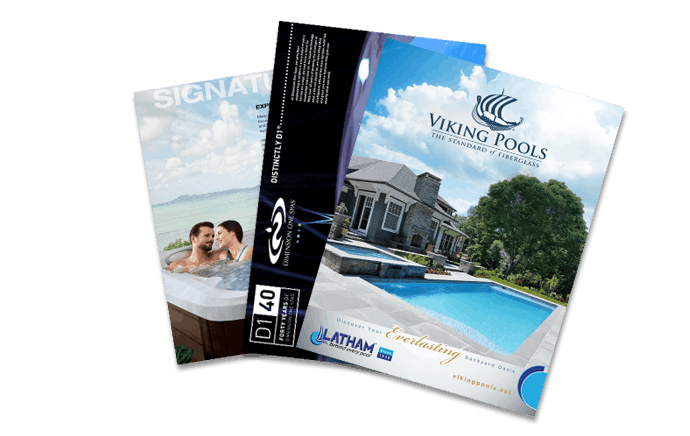 Even our high-end pool customers set realistic budgets so that the finished product is something they’ll truly enjoy, instead of a Frankenstein’s Monster of tacked-on extras that sounded good at the time but nobody really wanted. You really can’t get a good idea of what your options are and what extras are available until you do research, like reading this article. Learn your pool construction options (fiberglass, vinyl, gunite) and the pros and cons of each. Understand which is most affordable (vinyl liner), which is most customizable (gunite) and which is sturdiest and most durable (fiberglass and gunite). Then research what features are available (slides, diving boards, waterfalls, lighting, etc. ), and whether or not those work with the size of your backyard and your budget. The more you educate yourself, the happier you’ll be with the pool you get. Decide what’s important and what isn’t. Is it really that important to have a pool shaped like the Chicago Bears logo? Or would you rather have a “normal” shaped pool and spend that extra money on diving boards, water features, or a cool slide? Maybe a tanning ledge is important to you, or having a swim-up bar. There are many ways to save on one thing so you can splurge on what you really want, so jot down a list of your family’s must-have’s, would-like-to-get’s, and ah-we-can-do-without-it’s. Make decisions like whether to pay a little more now so you don’t have to change out liners later, or whether to include features the kids will enjoy, not just now, but as they get older. Pool builders can only build so many pools per season. There is only so much equipment, so many workers on staff, and so many days per year that the weather is suitable for pool building. Aqua Pools begins building pools as early as the spring thaw allows, and continues building until fall freezes shut us down. A particularly rainy summer can also delay our progress. We don’t try to build pools the fastest. We work to be the best. We’d rather build a pool that your family will be enjoying decades from now than to slap together something that has problems from the start. Secure your financing, if needed. Aqua Pools offers a couple of different financing options for our customers. Financing is available on all our “big ticket” items, including pools, hot tubs, and swim spas. You are also welcome to secure your own financing, through a home equity lender, credit union, or other source. It’s best to secure your financing before getting too detailed with your pool building plans. You’d hate to get approved for more, and miss out on getting that amazing waterfall, or get approved for less, and have to tank the plans for the natural rock formations. Getting financing secured earlier makes the planning process much smoother. Every municipality in Illinois is different, and it would be impossible for us to list all of those regulations here. Also, those laws change all the time. We recommend talking to your local building authorities early in the planning process, and securing permits well in advance of the pool build. Put on your patience cap! Know how it always seems like for-ev-er to get to the beach? Before you arrive, you decide you hate every one of your family members, this car was the worst buying decision you ever made, and people who stock convenience store snacks should probably go into a new line of work. But when you get there, the rough ride in the backseat with siblings who pinch and bite and kick are just a distant memory. Getting a pool is kind of like that. For awhile, you’ll wait. Then, your backyard will become a mud hole for a little while. At the time — just like the car ride to the beach — it’ll seem awful and like it’s taking forever. Hang in there. Be patient. At the end, the process will become a distant memory, and all you’ll have ahead of you is a lifetime to enjoy your pool. Unlike the trip to the beach, there’s no long ride back!